The baby knitting has finally gotten underway. Truly, madly, deeply. 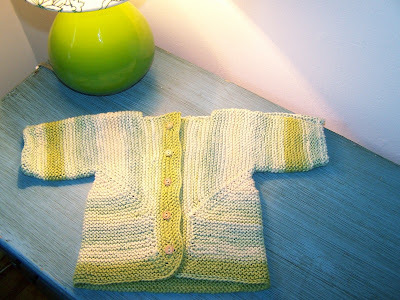 Baby Surprise Jacket was the first completed, and I have to tell you, when I finished binding off and folded it into an itty-bitty little jacket shape, my throat got all lumpy. So tiny! So perfect! So ready to keep a little person warm! But not too warm. I used Knit One, Crochet Too Ty-Dy, and while size 4 needles kept my gauge nice and tight, it is cotton we're talking about. I can't help it, cotton just feels so clean and babyish to me. And in any case, this jacket will fit Roo onward through Spring, so the fiber choice makes sense even from a logical, practical perspective. I really enjoyed the yarn. The color changes were smooth and subtle (and there's a lot of pale green in there that isn't really showing up in the photos). 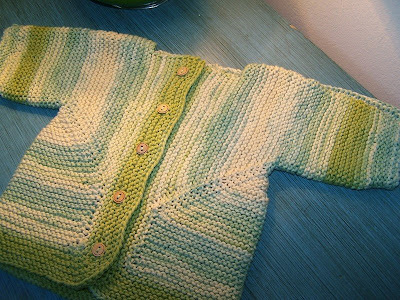 The bright green one-inch band certainly worked out nicely, and I have enough leftover to make Elizabeth Zimmerman's little garter stitch bonnet to match, if it's a girl--and if it isn't, I'll find a little girl to make that cap for, because it's too damn cute to pass up. (I don't imagine I'll have any trouble--my sister-in-law just found out she's having a girl, so keep holding your breath I'm having a boy, Kate, it really is that cute). I don't know that I'll make thirty of these sweaters like some knitters out there, but I did really enjoy this one. You would think that much garter would be somewhat monotonous, and it was in its way, but a very soothing kind of monotony. And it hasn't turned me off from garter--oh, heaven's no. This baby is going to be swimming in garter stitch, it seems. Or more likely, its arms will be sticking out a la Randy in A Christmas Story from all the garter stitchery. I think you're having a girl, though. But I will gladly take any knitted goods off your hands. I know a little girl who would love a hat from you.